Mary was born to be the mother of the Savior of the world, the spiritual mother of all men, and the holiest of God’screatures. Because of her Son’s infinite merits, she was conceived and born immaculate and full of grace. Through her, Queen of heaven and of earth, all grace is given to men. Through her, by the will of the Trinity, the unbelieving receive the gift of faith; the afflicted are tendered the works of mercy; and the members of Christ grow in likeness of their Head. In Mary all human nature is exalted. We rejoice in her birthday, as the Church has done from the earliest times. This is one of the three birthdays in the Church Calendar — the Birth of Jesus (December 25), the Birth of John the Baptist (June 24) and the Birthday of Mary. All three were born without original sin, although Mary and Jesus were conceived without sin, and St. John was cleansed of original sin while in the womb at the Visitation of Mary. On Our Lady’s birthday the Church celebrates the first dawning of redemption with the appearance in the world of the Savior’s mother, Mary. The Blessed Virgin occupies a unique place in the history of salvation, and she has the highest mission ever commended to any creature. We rejoice that the Mother of God is our Mother, too. Let us often call upon the Blessed Virgin as “Cause of our joy”, one of the most beautiful titles in her litany. The winegrowers in France called this feast “Our Lady of the Grape Harvest”. The best grapes are brought to the local church to be blessed and then some bunches are attached to hands of the statue of Mary. A festive meal which includes the new grapes is part of this day. In the Alps section of Austria this day is “Drive-Down Day” during which the cattle and sheep are led from their summer pastures in the slopes and brought to their winter quarters in the valleys. This was usually a large caravan, with all the finery, decorations, and festivity. In some parts of Austria, milk from this day and all the leftover food are given to the poor in honor of Our Lady’s Nativity. Symbols: bruised serpent, sometimes encircling a globe; the lily; fleur de lis; virgin’s monogram; pierced heart; crescent moon; sun and moon; starry crown; Mater Dei; rose; flowering almond; gilly flower; snow drop; hawthorn; the star; the balsam; the Ark of the Covenant; the mirror or speculum; apple; myrtle; palm, cypress and olive; closed gate; book of Wisdom; sealed book; rod of Jesse; lily of the valley; house of gold; city of God; vessel of honor; seat of wisdom. Eat some form of blueberries on this day, particularly in the morning — blueberry muffins or blueberry pancakes, blueberry pie or just fresh blueberries on your cereal. 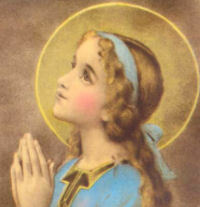 The blue is symbolic of Mary’s blue mantle. via Catholic Culture : Liturgical Year. It’s like a party at our house, cakes, chips, sausage rolls……….